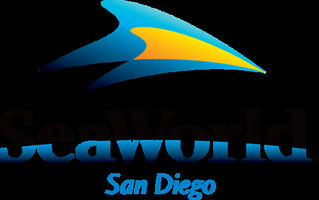 People across the globe – and in San Diego - know SeaWorld. But what many people don’t know is their deep commitment to the communities they serve. In addition to hosting EDC’s Annual Dinner last year, SeaWorld San Diego is involved in many programs that bolster our economy. Through various community initiatives, they have demonstrated their commitment to putting youth to work and conserving many of the region’s resources. 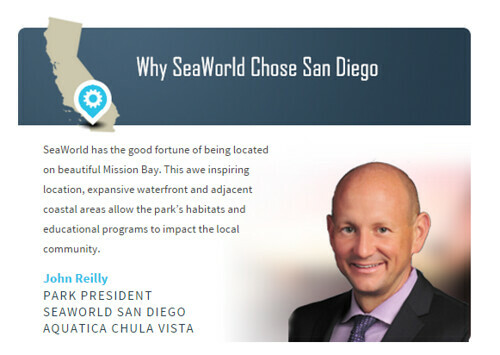 We sat down with John Reilly, park president at SeaWorld San Diego and Aquatica Chula Vista, to learn more about the company’s broad reach. Most San Diegans have heard of SeaWorld. Animals, shows, rides, Shamu —that’s all true, but most people don’t know how deeply SeaWorld affects the lives of park visitors. Jody Westberg visited the park as a youngster and dreamed of working with marine life. Today she heads SeaWorld’s animal rescue program, dedicating her life to giving ill and injured animals a second chance. Jenna Golden visited SeaWorld as a student enrolled in one of our camps. During college Jenna returned to the park as an Educator, and she now teaches youngsters about conservation and how their actions affect the world’s oceans. Kristi Burtis grew up in San Diego and enjoyed numerous Shamu shows as a child. Today she trains the park’s killer whales and shares the special bond she has with the animals with millions of visitors. So what does SeaWorld do? We entertain, educate, conserve and connect people with the natural world we share. SeaWorld has the good fortune of being located on beautiful Mission Bay. This awe inspiring location, expansive waterfront and adjacent coastal areas allow the park’s habitats and educational programs to impact the local community. The animal rescue program has tremendous access to local beaches for rescues and adjacent waterways to return healthy animals back to the wild. And, San Diego’s perfect weather, dining, shopping, beaches and world-class zoo make it a perfect place for tourists. Visitors from around the globe chose to holiday in San Diego. Few cities in America offer tourists such a vast array of activities and locales. The Hubbs-SeaWorld Research Institute, an innovative, independent, non-profit organization seeking real life solutions to sea life problems, recently launched two projects that are sure to impact global initiatives. On the research front, Hubbs is documenting the influence of infectious and non-infectious diseases on free-ranging animals, including zoonotic diseases (those transmissible from animals to humans). Marine mammals may play a role similar to pigs as hosts for influenza viruses and future studies are aimed at better understanding these relationships. This research has the potential to impact future medical advances and solutions. On another front, Hubbs has embarked on an ambitious fish farming program. The United States is the third-largest consumer of seafood in the world, but we only produce about nine percent of it domestically. Hubbs is proposing a creative solution that provides an alternative source of protein and a new paradigm in the seafood business. The project, which will start by raising about 1,000 tons of California yellowtail, could serve as a model for environmentally sustainable offshore aquaculture. 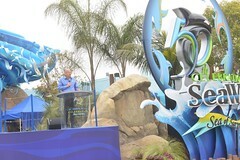 This year SeaWorld celebrated its 50th anniversary and we could not be more excited about the park’s future. A few months ago we announced the Blue World project. Blue World includes a first-of-its-kind killer whale environment, an Independent Advisory Panel that will focus on creating something innovative that maximizes the health and wellbeing of the animals, $10 million in matching funds for killer whale research and a multi-million dollar partnership focused on ocean health. The Blue World habitat will build on SeaWorld’s legacy of providing state-of-the art homes for its animals, and will offer park guests unique and inspiring killer whale encounters for generations to come. This new environment will have a total water volume of 10 million gallons, a maximum depth of 50 feet, surface area of nearly 1.5 acres and views exceeding 40 feet in height providing guests with the world’s largest underwater viewing experience of killer whales. This tremendous new environment will enhance the educational experience for guests, foster deeper knowledge of killer whales and their ocean environment and inspire them to celebrate and conserve the natural world. Blue World will open summer, 2018 and we know San Diegans are going to be awestruck at the incredible vista and one-of-a-kind opportunity to see and learn about killer whales.